Gov. Paul LePage answers questions from the audience during a town hall meeting at William S. Cohen School in Bangor on May 25, 2016. AUGUSTA, Maine — Gov. 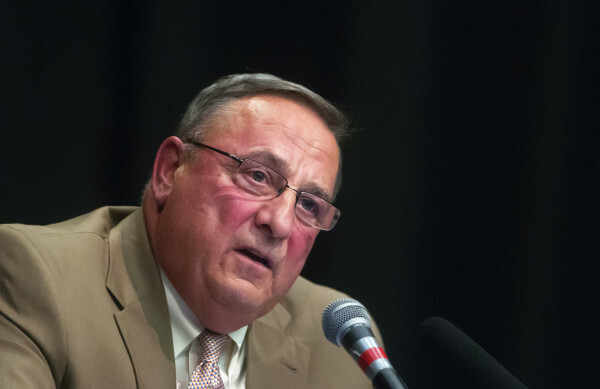 Paul LePage says despite his proposal being rejected by the Legislature and federal government, Maine will move forward with restricting the purchase of what he calls junk foods with food stamps in Maine — or give up administration of the program altogether. A USDA representative did not respond to a question about whether the federal government administers the program in any state, though the USDA website indicates that it is a state-run program without any other explanation. On Tuesday evening, U.S. Rep. Chellie Pingree, a Democrat who represents Maine’s 1st District, said that the USDA had informed her that if Maine opts out of administering SNAP, recipients in the state would lose benefits. The USDA informed Pingree that “states have the option to administer [SNAP]. If they choose not to do so, their citizens will not receive these nutrition assistance benefits. USDA does not have the authority or funding to administer SNAP at the state level,” according to a release from her office. Democratic Rep. Drew Gattine, D-Westbrook, who co-chairs the Legislature’s Health and Human Services Committee, said he doesn’t think it’s possible for a state to turn over administration of the SNAP program. At issue is the LePage administration’s long-held goal of restricting what can be purchased with SNAP benefits. Attempts to pass state laws to impose limits on what recipients can purchase through the program — which is fully funded by the federal government but administered by states — failed in 2013 and 2015, so the administration requested a waiver from federal rules. That waiver was denied. As of June 1 of this year, more than 195,000 individuals in Maine were receiving SNAP benefits. In 2015, more than $292 million was distributed in Maine through the program. LePage wrote in his June 17 letter to Agriculture Secretary Tom Vilsack that restricting the purchase of candy and sugar-sweetened beverages “is such a commonsense proposition that a demonstration project should not even be necessary.” He said “special interests” are to blame. In its June 8 response to Maine’s waiver request, the USDA said essentially that the state has not provided enough guarantees that the pilot program on purchase restrictions would yield clear results or that retailers are prepared to provide the necessary data. The letter also cited recent media reports about lags in the administration of Maine’s SNAP program, which angered LePage. In late May, the Bangor Daily News published a story about more than 2,200 Mainers who must repay SNAP benefits that were overpaid to them because of errors at DHHS. A 2014 SNAP report on the USDA’s website, which includes the most recent nationwide data available, shows that Maine DHHS made about 600 mistakes in fiscal year 2014 in which it distributed an incorrect amount of SNAP benefits. That was along with another 500 mistakes made by recipients and 185 cases of intentional fraud. However, data provided to the Bangor Daily News by DHHS in early May indicated that the error rate continues to increase. The data showed that agency errors increased to more than 2,200 instances in 2015, plus another 800 agency errors in the first four months of 2016 alone. In late 2015, the federal government chastised Maine for having the slowest processing times for food stamp applications in the country. It warned that without improvements, Maine could lose federal assistance in administration costs for the SNAP program, which are split between the state and federal governments. “Before moving forward with any new demonstration program, USDA encourages Maine to resolve the state’s multiple longstanding issues that present obstacles to low-income Maine families on SNAP, including timeliness with processing applications, claims backlogs related to state-administered errors and staffing shortages,” read a statement from a USDA spokesperson to the Bangor Daily News on Tuesday. However, errors in the SNAP program are common in states across the U.S. In 2014, there were a total of more than 330,000 errors. According to the USDA’s SNAP website, restrictions on how food stamps can be used include alcohol, tobacco products, non-food items such as pet food and household supplies, vitamins and medicines, food that will be eaten in the store and hot foods. The website says explicitly that “soft drinks, candy, cookies, snack crackers and ice cream are food items and are therefore eligible items.” Also eligible are seafood, steak and bakery cakes. — There are no clear standards to differentiate “junk food” from nutritional food, making it difficult to determine whether foods with a mix of healthy and non-healthy ingredients should be eligible. — Implementation of food restrictions would be complex and costly at both the governmental and local retailer level. — There is no proof that restricting purchases with food stamps will change buying patterns or improve the health of food stamp recipients. The USDA said in a statement Tuesday to the Bangor Daily News that it encourages states to be creative when it comes to addressing obesity and healthy eating by SNAP recipients. Maine has made significant changes to its welfare programs in recent years. In 2014, Maine instituted a work requirement for recipients that cut food stamp rolls by thousands. Later that year, it sparred with the USDA on a photo ID requirement for recipients and in September, it announced that it would restart an asset test to determine eligibility for cash benefits. Earlier this month, the ongoing friction between Maine and the federal government boiled over to Capitol Hill as a House subcommittee conducted hearings on how to improve the SNAP program. Maine Health and Human Services Commissioner Mary Mayhew argued that the federal government is too stubborn about allowing reforms, such as allowing state agencies to share data and allowing the placement of photographs on benefits cards — which Maine did over the objections of the USDA. “It does feel as though we’re constantly receiving all the reasons why we can’t move forward,” said Mayhew. “We simply want it done properly,” he said. USDA has never granted a state’s request to restrict certain junk foods from the SNAP program.